Hello and welcome to Heartstrings! I am happy to be a part of this wonderful blog hop showcasing all the fantastic handmade ornaments. Thanks to Jess for all her hard work organizing this event. If you have been hopping along from the beginning, you probably arrived here from My Quilling Nest. If you came upon this post all on your own, you can hop on over to the very beginning at KinderstampO. All of the blogs in this hop have a fun and unique ornament to share with you. We also intend to give one away. 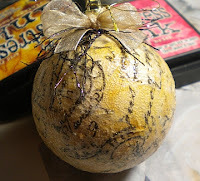 In my case, I will be mailing out one of my handmade ornaments to a lucky person who visited this blog and leaves a comment. By leaving that comment you also will be eligible for the grand prize giveaway. Details about what that entails are at Jess' blog as well. And now...on to the ornament!! I went to the dollar store and bought a tube of plastic, very plain Christmas balls. Choose ones that have a smooth surface. There were 6 in the package for $1. Really, how can you go wrong? 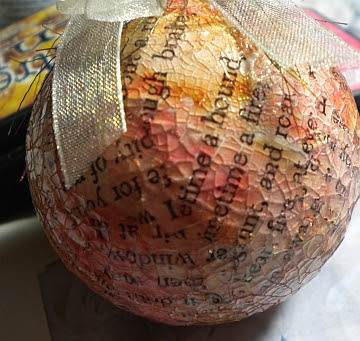 Using the Ranger Glue N' Seal I decoupaged little pieces of the Tim Holtz tissue tape all over the ornament. Don't be afraid to be generous in the application. It dries to a nice smooth matte finish. After it was dry, I rubbed a little distress ink into the ball. Next I used a generous application of Distress Crackle Paint. After this was dry I rubbed in a little more distress ink and finished it off with some Rock Candy Stickles. 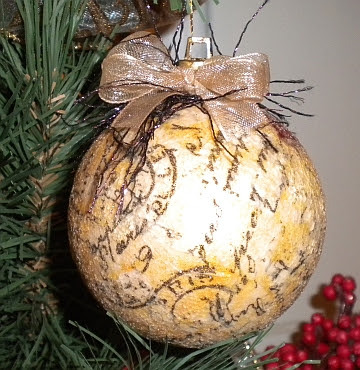 After some consideration, I liked the look of this ornament but thought it would be just as effective to use regular paper. I bought an old used paperback of Shakespeare a year or so ago just for moments like this. I tore a page into tiny little pieces and adhered them to the 2nd ball in the same fashion. 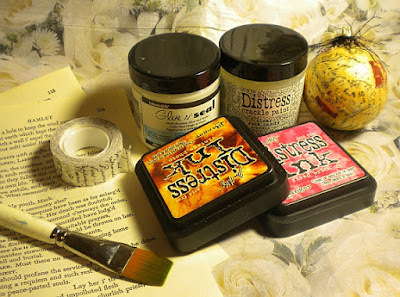 Much more economical and don't tell Tim Holtz, but it was easier to work with than the tissue tape too! Following the same steps...Here is how it turned out! Here is another look. I love the crackle effect. I hope you do too! Thank you for visiting my blog today! If you are ready to continue on....please hop on over to Tanya's Blog. Remember to become a follower and leave a comment if you would like to own one of my ornaments AND own one of my original design rubber stamps. I love these - and I agree, they both look equally lovely! I've been following for a while now - thanks for sharing. Awesome.. I so love the crackle. Beautiful Ornament. How nice, I like the crackle effect. Both of these ornaments are gorgeous. They look very vintage with the crackle effect. Thanks for the inspiration. Both ornaments turned out beautifully! The crackle is very cool. Thank You for being in the hop and I am a follower of your blog! Cool. I love using book text. Very cute Shelley!!!!!! Love it! This is fabulous! TFS Happy Holidays! Wishing you and yours a very Magical Christmas! I completely LOVE this idea and I'm doing it next year! The end product is so perfect for me! Fabulous ornaments. 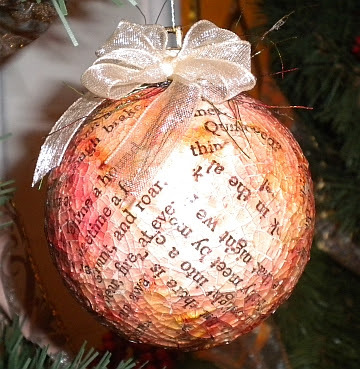 I love the design of this and I bet looks gorgeous on a tree. Thank you so much for the beautiful inspiration and the wonderful tutorial. I hope you have a fantastic weekend. ohhhh. ps i am a new follower and look forward to seeing more of your creations. Super beautiful. I'm a new follower of your blog. Thanks for the chance, Johanne L.
ooh... both are really pretty! fun technique, I will have to try it! beautiful ornaments. tfs. i'm already a follower. LOVE this! Thanks for sharing this idea. Your vintage ornament is divine and deliciously distressed!!! Thanks for the chance to win! I love the vintage look. thanks for sharing.